Domino's is running a "buy one, get one free" deal on pizzas ordered online for carryout for a limited time through Sunday, September 24, 2017. As is typical of these type of offers, the first pizza has to be purchased at the regular menu price and the free pizza must be of equal or lesser value to the first. 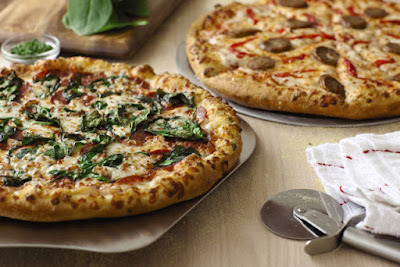 - A Medium, 1-Topping Handmade Pan Pizza is regularly $10.99. - A Large, 1-Topping Hand-Tossed or Brooklyn Pizza is regularly $11.99. - A Large American Legends or Feast Pizza is regularly $17.99.